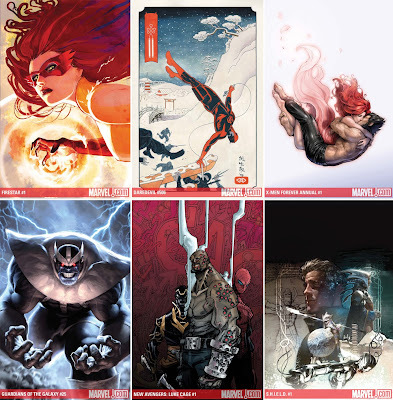 Artist and Title (Clockwise from left): STEPHANIE HANS - Firestar #1, PAOLO MANUEL RIVERA - Daredevil #506, SANA TAKEDA - X-Men Forever Annual #1, ALEX GARNER - Guardians of the Galaxy #25, ERIC CANETE - New Avengers: Luke Cage #1 (of 3), and GERALD PAREL - S.H.I.E.L.D. #1. For full solicitation details visit CBR. That Firestar cover is beautiful. I'll say Rob! Fabian's New Warriors was one of the best runs I've ever collected of a title, so it's cool to see one of it's stars get a bit of solo-press.